During her stay in Kathmandu between Feb. 4 and Feb. 12, Willa Schneberg taught at the Dharmakirti Vihar before a large group of Nepalese Theravada Buddhists, lay and monastic. She also taught at a number of other venues. In an interview with OPA newsletter editor Bruce Parker, Willa discussed her time in Nepal. 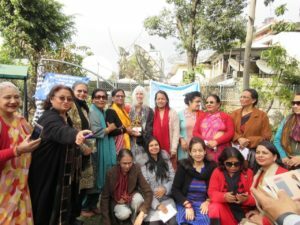 BP: How did you become a poet-in-residence in Kathmandu, Nepal? WS: Nepali poet, Nabin Chitrakar, heard me read at the Eastside Freedom Library, an arts and social justice venue in St. Paul, Minnesota, where his son and daughter live. We began an email correspondence that evolved into how I might bring my flavor of poetry to Kathmandu. He arranged six poetry-related programs. I received a RACC (Regional Arts & Cultural Council) Professional Development grant given to Oregon artists who live in Clackamas, Multnomah and Washington Counties, to cover travel expenses. My lodging and meals were provided by husband and wife, poet Dwarika Shresthra, and short story writer, Jaleswori Shresthra. I was in Kathmandu for 9 days in February. BP: Please give a short overview of the programs which you presented. BP: What did you speak about? WS: I gave a talk at the Nepal Academy, an institute for the promotion of languages, literature and culture, entitled “Translating Poetry: The Art of Preserving Essence;” at the Nepal Academy of Fine Arts, gave a slide presentation about the interface between poetry and sculpture; offered a Political Poetry workshop with graduate students in English and Philosophy at the Institute of Advanced Communication, Education & Research; spoke to Nepal Bhasa Parishad members, an organization which promotes works in the Newari language; and to members of “Gunjan,” the Nepalese women writers’ group. The Newari and “Gunjan” participants shared their own poems, predominately translated into English. My final talk on “The American Buddhist Poem” took place at the Dharmakirti Vihar. The enthusiasm and depth of discourse between me and the writers and artists at al my programs was astounding. BP: What is an “American Buddhist Poem”? BP: Would you like to tell us anything more about this kind of poem? Do you write American Buddhist poems? What can a non-Buddhist Westerner gain from reading such a poem, from writing such a poem? WS: If you want to move this into the totally secular realm, I am discussing writing a “mindfulness” poem, one in which an individual is fully present, totally open to the moment. I am a Jewbu, have a meditation practice, and am a member of a sangha, but do not consider myself a Buddhist poet. I do contemplate the causes of suffering and impermanence in my poetry. The reality of “birth, old-age, sickness”, and the inevitability of “death” does not just apply to Buddhists. It is universal. BP: Do you have a relationship with working in Asia or presenting overseas? WS: In 1980, I was employed as a “professional poet” by Department of Defense Schools in the Philippines, Japan, Korea and Okinawa. Living internationally has generated material for my poetry collections Storytelling in Cambodia (I worked from 1992-1993 with the UN), and In the Margins of the World, which was awarded the Oregon Book Award. In Israel, I facilitated workshops, gave readings and judged the poetry contest of “Voices Israel”, a group of Israeli poets who write in English. (2004/2014). BP: When did you first begin to write poetry? What motivates you to write poetry? WS: I started writing poetry as a teenager as a way to express what I felt most deeply. I could be brutally honest about my thoughts and feelings. It wasn’t for others. Only later did I understand that poetry could be a vehicle for communication and social change. As a citizen of the world, I believe I must bear witness to the immoral, to the unspeakable horror that humankind is capable of inflicting on the earth and itself. Poetry’s precise, musical, metaphor-infused language can get to that place beyond the illusion of the objective, to “true” words. Adrienne Rich has talked about writing out of a “radical happiness.” She has said, “ Real social transformation, real change has to come out of a love of life and a love of the world…” Of course, I don’t believe poetry alone can be a change agent, but it can incite the necessary conversation. BP: Thank you, Willa, and thank you for the photo of you with your audience at Gunian.